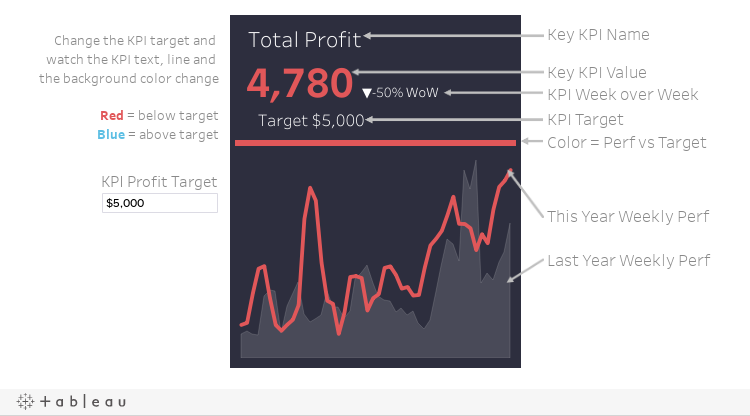 Some folks asked how I made the KPI metric cards in the KPI dashboard from my 5 Types of Dashboards post. This card is a good way of communicating a KPI, performance vs target, and trend over time. The original design trick of the color bar underlining the text was taken from Adam Crahen. The above version is a minor redesign of the original card that I think is cleaner. In this view the color, line, and text color changes when the KPI value is higher or lower than the target. Download to reverse engineer. Please let me know if you have any questions. Hi Adam, Thank you for sharing your work. It's very useful. I have a question on controlling the font size? Could you please explain for recommend some materials I can follow? I appreciate it. Thanks! Can you elaborate? Are you asking how I make some of the fonts small or large?